Little Giraffe - or perhaps a zebra? Little Giraffe – or perhaps a zebra? Babyologists, you may well have heard of the brand Little Giraffe before; they’re the company providing babies and tots with the most gorgeous, luxuriously soft blankets. It appears they have a celebrity cult following with the likes of Katie Holmes, Nicole Richie and Gwen Stefani (to name-drop a few) seen toting their babes wrapped in these opulent blankets. The newly launched Zebra Luxe blankets are perfect for people looking for something special – a funky blanket indeed with the striking zebra print on one side and solid colour on the other, then bound with a beautifully smooth satin edge. It’s an excellent choice for anyone wanting a bit of rock star edge in the nursery. 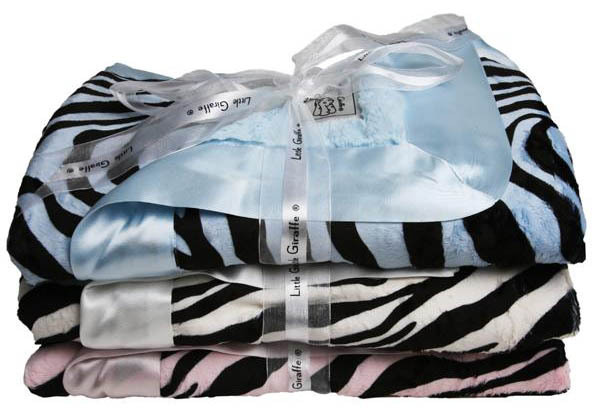 Good news: Little Giraffe is not only for the rich and famous – you can get yourself a little bit of luxury at Shop Baby Trends, where Zebra Luxe blankets are US$82 each. Shipping is available to Australia.